Ive been here once or twice, and it is super cozy and dark, and mellow. I remember it being a wine bar, which I am not in love with. What if I want my ketel martini on the rocks extra dirty? Can’t get that here. I have a friend who loves this place and says it’s the ideal date spot. I trust his advice. One of the best places to bring a date is to this beer and wine bar on Perry St. The back room and wall is lined with couch style seating while the bar provides ample room to sit and chat. The scene is west village chic with everyone from artists to businessmen kicking back. Be sure to try to the one of their weekly wine specials while your there. 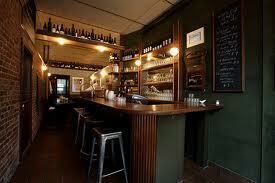 Hands down, one of the best wine bars in the New York. The crowd is good looking, the portions are fantastic for sharing and the noise level is just loud enough where you can’t help but here the group next to you. Small plates like meatballs, truffle mac and cheese and prosicutto salad are a must. And be sure to check out the cocktail specials scribbled on the chalkboard against the wall. Completely agree with all comments above. I have never been to a wine bar (yes this is coming from a semi-wino) but it definitely is a great place and agree with aforementioned as perfect date spot. Tucked away, trendy, dark but not too dark, people there but not too crowded, intimate, can actually hear eachother etc. etc. I can also see groups of girls enjoying with friends but you won’t catch me here with the boys. Easy & no hassles, it is everything it needs to be and nothing more. Simple & elegant.